How to make chicken stock in a crock pot using our favorite chicken stock recipe. Use this EASY, delicious and nutritious basic chicken stock for all of your favorite gravies, soups, sauces and to boost the nutritional value of rice. The long, slow cooking of leftover meat and bones dissolves collagens and gelatins and results in a wonderful bone broth, full of flavor and nutrients to be used in recipes. Because crock pots cook things slowly, they are perfect for making broth. This basic chicken stock recipe is wonderful on its own to settle a sore tummy when your child is sick. You can replace up to half of the water in your rice recipes with stock to make it more nutritious and much tastier. 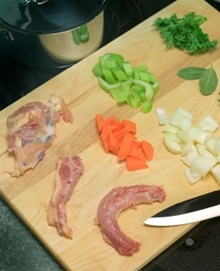 This recipe for chicken stock is one of our favorite healthy crock pot recipes. The words “broth” and “stock” are used interchangeably in may cookbooks for good reason, the differences between the two are very small. In general, “broth” is a home cooking term while “stock” is used more for professional cooks. In general, broth is made from the meat of an animal while stock is made from leftover bones mainly with less meat. Using bone gives stock a more gelatinous texture and greater clarity. Broths tend to be thinner and cloudier. Stocks which include the added bone and often vegetables are more nutritious as well as better for digestion than broth. Even basic chicken stock is extremely nutritious, containing the minerals of bone, cartilage, marrow and vegetables as electrolytes, a form that is easy to assimilate. Vinegar added during cooking helps to draw minerals – particularly calcium, magnesium and potassium – into the broth. The gelatin in this basic chicken stock recipe is especially beneficial. Gelatin acts first and foremost as an aid to digestion and has been used successfully in the treatment of many intestinal disorders including hyperacidity, colitis and Crohn’s disease. Although gelatin is not a complete protein, it acts as a protein sparer, allowing the body to more fully utilize the complete proteins that are taken in. Learning how to make chicken stock will add immensely to the flavor of your cooking. In European cuisines, rich stocks form the basis for exquisite sauces when combined with herbs and/or wine. If you make chicken stock, your cooking will be delicious and nutritious. 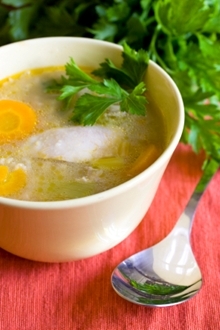 In folk wisdom, rich basic chicken stock / broth – the famous Jewish penicillin – is a valued remedy for the flu. Moses Maimonides, a 12th-century physician prescribed a chicken stock recipe as a treatment for colds and asthma. This basic chicken stock recipe can be made in bulk and stored until needed. Clear stock will keep about five days in the refrigerator, longer if re-boiled. In the freezer it lasts at least six months and we have used it up to two years after making it. You may find it useful to store stock in pint sized and quart sized containers so that you can defrost just what you need for a recipe. If space is at a premium in your freezer, boil your stock down for several hours until it becomes very thick and syrupy. This concentrated stock can be frozen in small containers or zip-lock bags and thawed easily in cold water. After thawing, simply add water to turn it back into stock. Be sure to label your basic chicken stock with the date and what kind it is (regular- reduced – concentrated, includes fat) because it will all look the same once it is in your freezer. As with all stocks, it is important to start with cold water. At the ingredients warm in the water, their fibers open slowly, releasing their juices to add flavor. As with all of our recipes, use only organic and/or free-range ingredients from reliable sources. Turn your crock pot on to “low” and let it go for at least 24 hours and up to 48 hours – it will look like brown mush – but don’t worry, it will taste wonderful! Strain stock thru a large colander into a large bowl. You should have a rich golden liquid in the bowl. Fill pint and quart sized containers with stock, using a tea strainer to remove any last little particles. Label stock with the date and store or add veggies and leftover chicken for an easy chicken soup.